More than 2,200 years after it sank beneath the waves, diving archaeologists have possibly found a missing piece of the Antikythera Mechanism, the fantastically complicated, advanced analog "computer" found in a shipwreck off a Greek island. Scanning shows the encrusted cogwheel to bear an image of Taurus the bull. The Antikythera Mechanism was discovered in 1901, technically speaking. An encrusted lump was salvaged by Greek sponge divers in clunky metal diving suits from the Mediterranean seabed. Not that anybody realized what it was at the time. It would take decades and advanced x-ray technology for scientists to realize that the "rock" was a wondrously advanced sophisticated analog calculator consisting of dozens of intermeshed gears. The Mechanism could do not only basic math: with dozens of exquisitely worked cogwheels, it could calculate the movements of the sun and moon, predict eclipses and equinoxes, and could be used to track the solar system planets, the constellations, and much more. We may never know how many cogwheels the original Antikythera Mechanism had. Assessments based on its functions in predicting the behavior of the cosmos range from 37 to over 70. For comparison, the most advanced Swiss watches have four cogwheels. As for the ship bearing the Mechanism, it had been a huge one, laden with precious cargo. Happily, even a century of looters and incautious explorers who combed the site since the ship's original discovery didn't find everything. The cargo ship carrying the Mechanism and other treasures sank near the island of Antikythera, hence the Mechanism's soubriquet. It likely succumbed to the wild weather typical of the waters in the western Aegean Sea between Greece and Cyprus. In 1901, the divers found one skeleton with the remains of the ship. 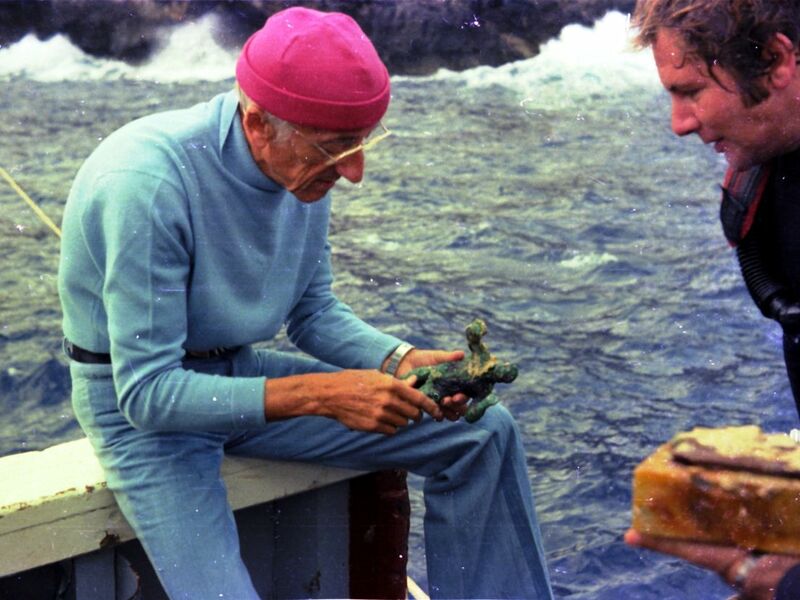 Later investigation of the wreck in 1976, by a team led by the famous underwater explorer Jacques-Yves Cousteau, found various bones that have been interpreted as four individuals. 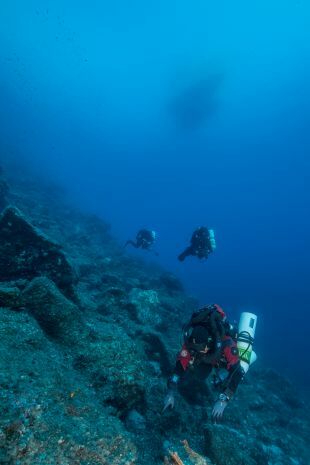 Come 2012, a new team, led by Dr. Brendan Foley of Woods Hole Oceanographic Institution (and after 2017, Lund University), returned to the waters by Antikythera to relocate and resurvey the original wreck site, armed with the latest technologies. 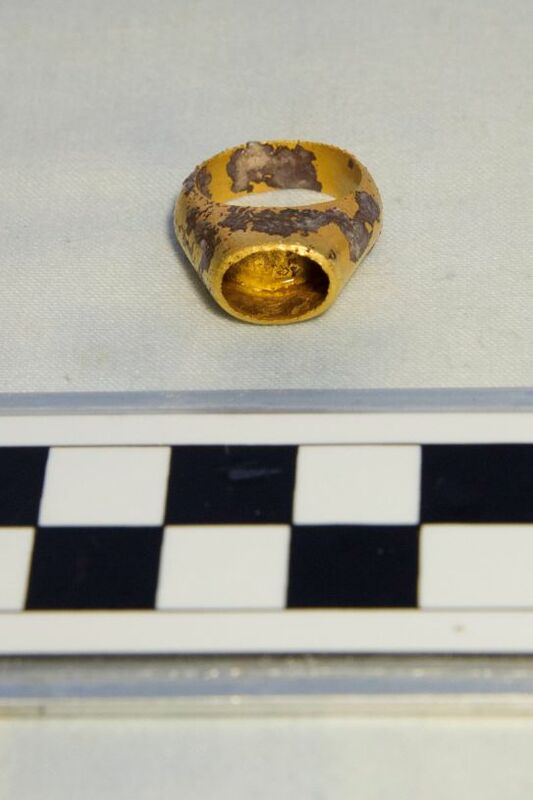 They found it, with its cargo scattered down a 55-meter downward slope, and also found the remains of a sixth person who had gone down with the ship. Much of the hull had been literally eaten up in the centuries followed the shipwreck, consumed by marine animals such as the shipworm. In the 1970s, more than two decades after his first survey of the site, Cousteau and his team salvaged some hull bits, including planks, Dr. Brendan Foley of Lund University told Haaretz. In the process, some of the rest of the hull was destroyed. A half-century later, starting in 2012, underwater archaeologists uncovered hundreds of artifacts, including two massive bronze spears, the life-size bronze representation of an arm, other pieces of marble and bronze statues, mosaic glassware, pieces of bone-inlaid furniture, blue game pawns, a sarcophagus lid, gold rings, and silver coins. 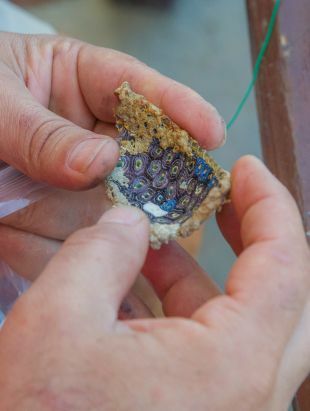 They also found an encrusted, corroded disk, which was pulled from the seabed in 2017. 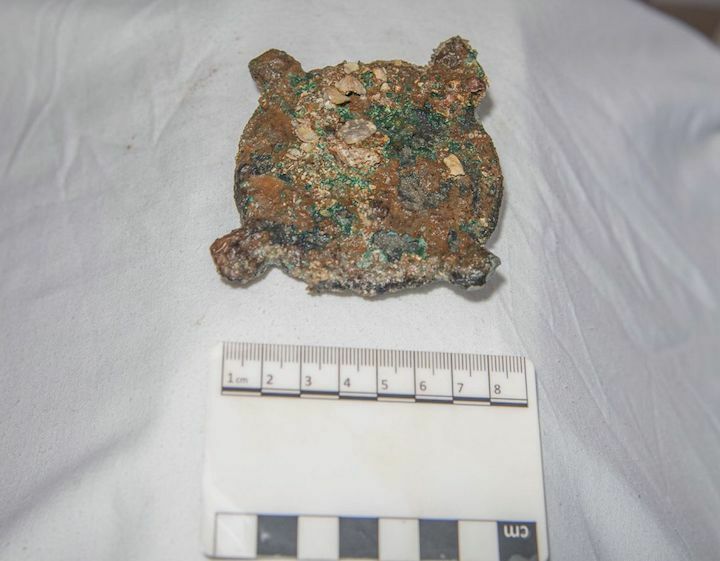 Like the original Antikythera Mechanism, after nearly 2,100 years underwater, the disk resembled greenish rock. About eight centimeters in diameter, the object still has four metal arms standing proud of the corners, with holes for pins. 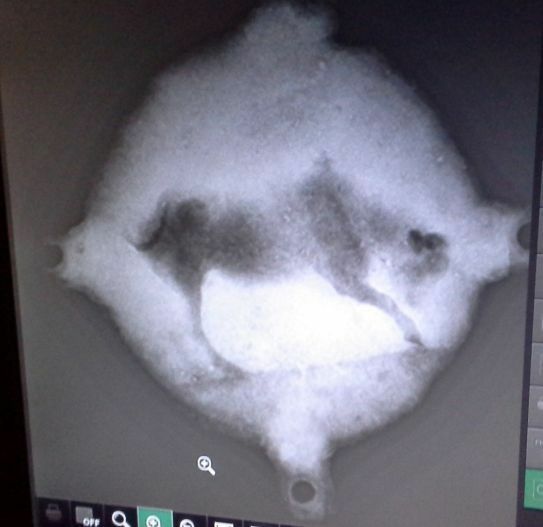 X-ray analysis shows the disk to bear the engraving of Taurus the bull. It will be difficult to prove what exactly the Taurus disk is: part of the original Antikythera Mechanism, part of a second such mechanism, if one existed, or something else entirely. 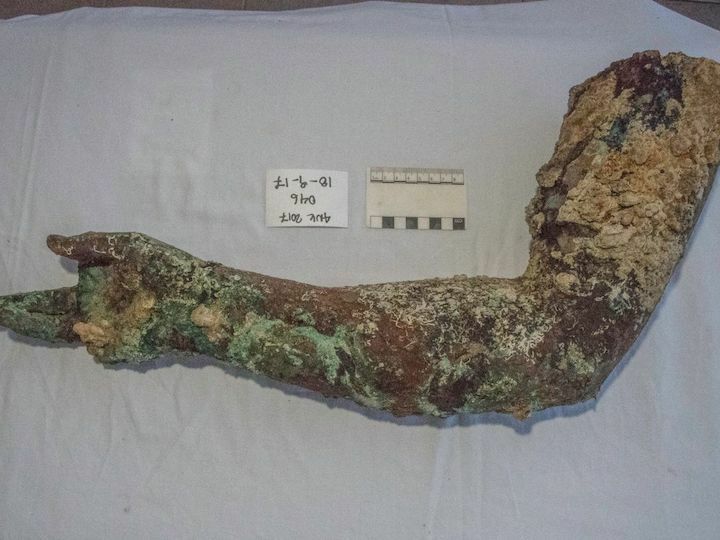 The merchant ship that sank sink off Antikythera carried a cargo of about 50 life-size marble statues and bronze statues, some based on heroes in Homer's masterpieces, the Iliad and the Odyssey, including Odysseus and Achilles. That discovery has rather puzzled archaeologists, because the Homeric motif was believed to have gone out of vogue before the first century B.C.E., when the ship set sail – and such statues were not being produced any more. Yet this ship that went down by Antikýthera had a whole set of such statues. Perhaps the Homeric motif had not gone out of fashion after all; or a person with the means to order such statuary had retro tastes. In 2014 and 2015 the diving archaeologists found two bronze spears, two meters in length, but they hadn't been weapons of war. They had been part of the sculptures. Interestingly, the two spears are different in style: one is armor-piercing and the other is lightweight. “These are the two only archaeological examples of spears that belong to sculptures that have ever been found,” says Foley. Right by where the bronze disk was found in 2017, the archaeologists found several new statue parts, including marble feet attached to a plinth, part of a bronze robe or toga, and a bronze male arm, with two fingers missing but otherwise beautifully preserved. Based on these finds and others recovered in 1901 and 1976, the excavators suspect that at least seven more bronze statues remain buried under the seabed. 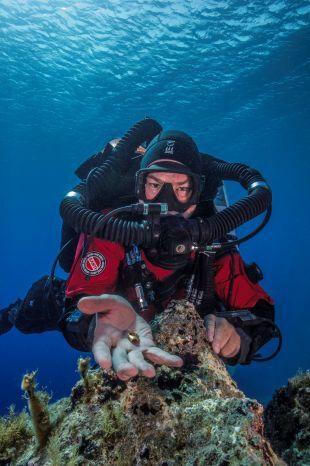 Speaking of unsuspected technological prowess, recent X-ray imaging of a bronze statue discovered in the Antikythera wreck by Cousteau’s team in 1976 revealed a mechanical device inside its circular base, that apparently rotated the statue when a key was turned. This has yet to be confirmed. 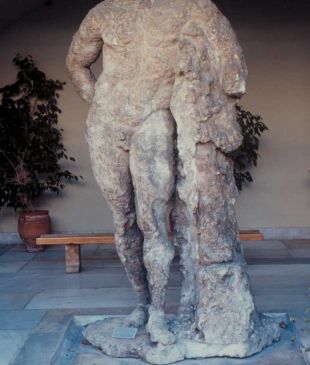 The statue dates from the second century B.C.E., contemporary or possibly older than the Antikythera Mechanisms. It could well be the earliest known example of a geared device. 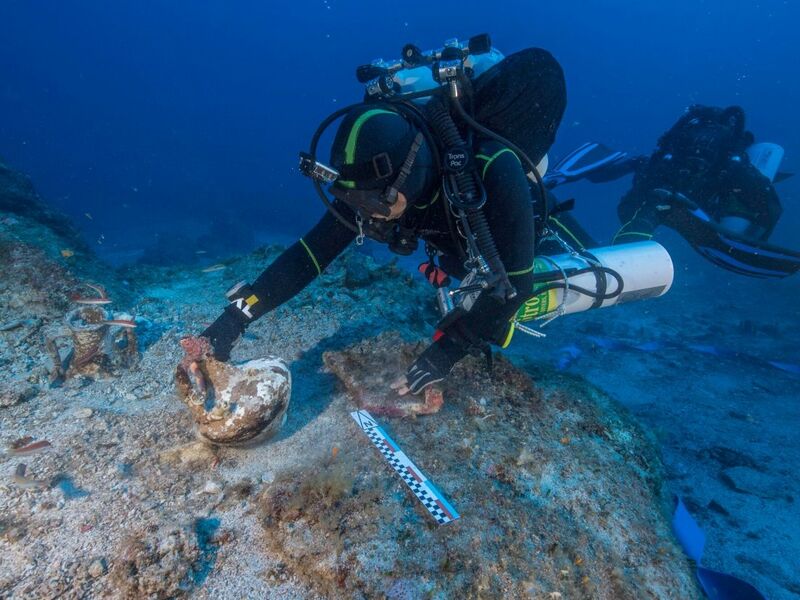 Who made the Antikythera Mechanisms remains a mystery. But historians suspect they can guess who commissioned this cargo: the brilliant Roman commander Lucius Licinius Lucullus, who had humble beginnings but developed a keen appetite for spiritual and physical pleasures. Today Lucullus is better known for his lavish dining habits than his military skills, thanks to a few funny anecdotes by Plutarch, who wrote his biography with his tongue rammed firmly into his cheek. 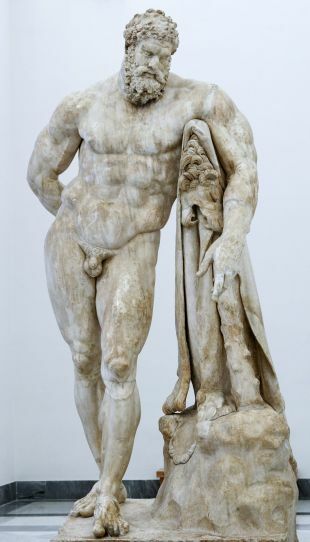 Anyway, in 60 B.C.E., after an illustrious career in pursuing war, Lucullus retired to a spectacular villa that he had built along the bay of Naples, which he decorated with paintings and sculptures collected during his many military campaigns. After he had defeated the king Mithridates, who ruled over Pontus, a small kingdom south of the Black Sea in today's Turkey, a great deal of bounty befell him, including the Pontiac kings' library. Some scholars suggest that the Antikýthera cargo was one of Lucullus' loot ships. There could be another explanation altogether. Around 70 B.C.E, when the Antikýthera ship sailed, the senatorial class, who had become the nouveau riche of the time, loved to decorate their villas with Greek artworks. They commissioned thousands of ships to bring them treasures from territories around the eastern Mediterranean. The wealthy roman Cicero, who by the way was a close friend of Lucullus', sent out a curator to procure statues for his villas and mansions. In Roman times the greatest imperial ships were grain freighters, with a capacity of 340 tons. But merchant ships could run to 1,300 tons, possibly more. According to a description penned in the second century C.E., the Alexandrian grain carrier Isis was over 55 meters long, about 14m wide, had a hold some 13m deep, and could probably carry over a thousand tons of grain as well, perhaps, as a few hundred passengers. All well and good, but in shipping, to maintain the stability of the vessel, the volume needs to be filled with mass. In other words, the ship needs to be weighted down. However, the bronze and marble statuary, albeit life-size, occupy a lot of space for their volume. “The theory is that they were stored in the cargo room with sacks of grain around them,” Foley says. What can be said of the ship that was wrecked at Antikýthera carrying this immense cargo of heavy statues, the extraordinary Mechanism, and, possibly, hundreds of passengers on board? It was a Greek grain ship from the Hellespont that was sailing for Italy, Foley avers, adding that the ship's planks are by far the biggest ever recovered from any other ancient shipwreck. "Even in their shrunken state, they are ten or eleven centimeters thick,” he says. In fact, the only surviving comparable vessels are the "Nemi ships" that that the crazed Roman emperor Caligula had built as floating pleasure palaces in Lake Nemi the first century C.E. Two were discovered when Italian dictator Benito Mussolini had the lake drained in the 1930s and divers have since been searching for a possible third. Other ship components retrieved from the original wreck off Antikýthera include a bilge pipe, hull planking, Corinthian roof tiles, bronze nails, and rigging rings. The exterior surface of the hull was sheathed with thin sheets of lead. 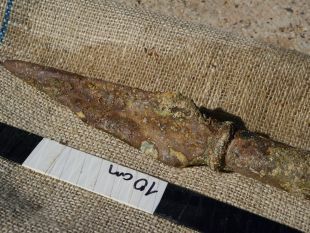 Parts of lead pipes the divers found have been associated with the water drainage pump. The discovery of roof tiles suggest the deck had a covered area, which probably served for preparing and loading hatches. 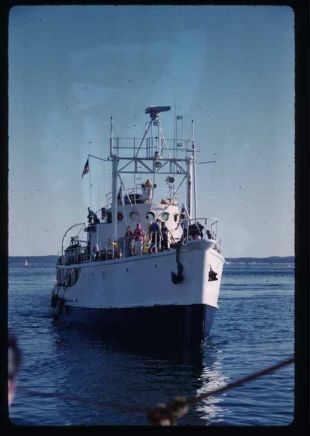 While surveying the seabed, the divers found a second shipwreck, from about the same era. Like the first wreck, the second one is also scattered its bits and cargo down a steep slope, extending from 35 meters below sea level to more than 55m. In 2012, the divers recovered a lead anchor stock and collar, and in 2016, a lead pipe, a tile that may have come from the hearth in the galley, bronze nails, a lagynos (Hellenistic-style vase) with an elaborate handle that looks like twisted rope, and several fragments of amphoras and one intact amphora. The styles of these ancient ceramic jars are similar to those found on the first Antikythera wreck. More amphoras of different types still lie on the sea floor, as well as a large, concreted pile that seems also to consist of amphoras. There is also a very large lead anchor collar awaiting salvage. The Romans called the Mediterranean Mare Nostrum—Our Sea. Control over sea-lanes was imperative to the empire for more than military reasons. Just one reason is that the city of Rome itself depended upon the shipping industry for its food supply. With a population of about one million, Rome needed 250,000 and 400,000 tons of grain a year. Where did all that grain come from? The Roman-Jewish historian Flavius Josephus quotes the vassal king of Judah, Herod Agrippa II, remarking that North Africa fed Rome for eight months of the year, while Egypt sent enough grain to support the city for the other four. Thousands of seagoing vessels, probably including the Antikýthera ships, were involved in supplying grain to that city. The grain fleets were privately owned by Greeks, Phoenicians, and Syrians, who commanded and equipped them. However, the ships were hired by the State. As in the collection of taxes, the government found it easier to outsource the work. The archaeologists suspect that the Antikýthera ships were privately built and owned by Greeks. Chemical analyses of the ship's material, such as its lead sheeting, show that they were mined in Chalkidiki, in northern Greece. There is also a drinking cup inscribed with a Greek name, indicating that at least part of the crew was Greek. Why would grain ships have passengers on board, if they did? However lofty their fares, since the ships were principally for cargo, the passengers were secondary. Only water would have been provided: they would have had to bring their own food and supplies, and bedding. They would sleep on deck, perhaps under tentlike shelters erected at night and taken down each morning. The preponderance of evidence is that Poseidon brought the ships down, not pirates, though wouldn't have been unthinkable. In antiquity and certainly during the 1st century B.C.E., the seas of Asia Minor were crawling with pirates. Desperadoes and refugees of all nations and creeds united with Silician and Cretan pirates. The well-organized pirate endeavor was a constant drain on Rome’s maritime trade. Arming the merchant’s fleet with dolphins was one way to protect your investment. 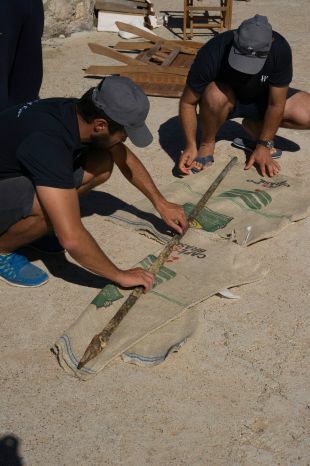 Another find with the Antikythera wreck is a "dolphin" - a 100-kilo lead bulb tipped with an iron spike. The dolphin would have been dropped from the ship's yardarm through the deck and hull of an attacking vessel. “Weapon systems don't stay around for 400 years if they are not effective,” Foley points out.